Women in eDiscovery (WiE) is launching a new Orange County Chapter. - Location: Stradling Yocca Carlson & Rauth, P.C. - Food Sponsor: Stradling Yocca Carlson & Rauth, P.C. To RSVP and for more information, please visit www.womeninediscovery.org. If you would like more information or have any questions, please contact the NHBA's President, John Cogorno at cogorno@msn.com. This annual event will raise awareness and critical operating funds to support the Legal Aid Society of Orange County (LASOC), a 501(c)3 non-profit organization founded in 1958 by the Orange County Bar Association. Your support of this event makes a difference, allowing us to provide free civil legal services to ensure safety, stability, and economic security for the indigent, the elderly, veterans, and families throughout Orange County and southeast Los Angeles. The event will feature live entertainment and unlimited tastings from more that 30 exceptional wineries, breweries and spirits, and restaurants. Click here to view the UCI Extension Spring Paralegal Program flyer, which includes our upcoming dates for our ACEDS E-Discovery Program and Night of Mentorship event. Congratulations to OCPA Board Members Kathy Miller, ACP, CAS and Kai Williamson ..
OCPA Board Members Kathy Miller, ACP, CAS and Kai Williamson were honored at the University of California, Irvine Extension Annual Instructor and Advisory Committee Member Appreciation Breakfast held on December 11, 2015. Kathy Miller, ACP, CAS was honored with the UCI Extension Distinguished Advisory Committee Member Award. This award recognizes advisory committee members who volunteer their time, energy and expertise in assisting the school’s program directors in the development and ongoing offering of certificate programs. Kathy was recognized for her 30 years of teaching and 15+ years on the Paralegal Certificate Program’s Advisory Board. The Advisory Board works with the program director to develop and implement the curriculum of the program. Kathy also received UCI Extension's Distinguished Instructor Award in 2006 and 2013. Way to go Kathy – Congratulations!! Kai Williamson was honored with the UCI Extension Distinguished Instructor Award. This award recognizes the contribution of instructors who have helped UCI Extension to remain at the forefront of continuing education and to provide students with the skills needed to advance careers in today’s rapidly changing business climate. Kai was recognized for her excellence in instruction and mentorship. Kai also received the UCI Extension Distinguished Advisory Committee Member Award In 2012. Way to go Kai – Congratulations!! What an honor to have both of these amazing Paralegals as part of our association. We are truly fortunate! OCPA members may access the Salary Survey results in the Members Only section of the website. Join us for Giving Tuesday on December 1st and give BIG to make an impact! On Tuesday, December 1, 2015, charities, families, businesses, community centers, and students around the world will come together for one common purpose: to celebrate generosity and to give. 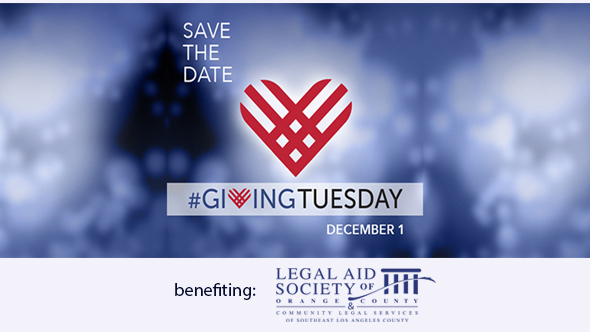 A donation to the Legal Aid Society of Orange County is a gift that lasts. Your contribution will help fund free legal assistance to those in our client community that would not otherwise be able to afford legal assistance. Veterans that have been wrongfully denied government benefits. Mothers and fathers, who are caring homemakers, facing child custody battles. Seniors who have been cheated by scammers or abused by their caretakers. Spouses and children who need protection from domestic violence. Homeless individuals that need assistance with legal issues to help them become self-sufficient. Our goal is to raise $20,000 this #GivingTuesday, but we can't do it without your help. Give a little, give a lot, but please just give and share the donation link with your network of friends and colleagues. To make a donation, click the button below. To get involved, contact give@legal-aid.com. As many OCPA members may know, use of checks as a method of payment has fallen drastically in recent years. At the same time, use of debit cards, PayPal and other forms of electronic payment has become the most common form of payment. In keeping with this trend, at its October 2015 board meeting, OCPA adopted a new policy for payment of membership and meeting fees effective January 1, 2016. Because electronic payments are generally safe and easy to use, the Board of Directors believe accepting electronic forms of payment will benefit OCPA members, including reducing wait time at meeting registration and protecting the financial health of OCPA. UCI Extension’s ACEDS E-Discovery Program is offered in collaboration with the Association of Certified E-Discovery Specialists (ACEDS) and designed to teach you about conducting discovery of electronically stored information (ESI) in litigation, as well as best practices related to the legal, technical and ethical considerations involved. The presentation will cover the role of e-discovery as a sword and as a shield, strategic use of e-discovery tactics, tips and tricks for ‘finding the dirt’ and the importance of documentation.